At the Park Hyatt Shanghai, the feeling that you’re on top of the world is no illusion. The hotel sits atop the highest skyscraper in the city and going up the lift to the 87th-floor lobby, you can’t help but feel like you’re on a roller-coaster ride, albeit an incredibly smooth one. Once inside the lobby, the overt extravagance of the hotel’s architecture gives way to elegantly muted interiors imagined by designer Tony Chi. From the cream and chocolate-brown hues of the lobby and lounge areas to the playful artworks and bursts of greenery throughout, there is a Zen-like calmness to the Park Hyatt Shanghai. Not to be missed while you’re here are peaceful moments at the Water’s Edge spa where the infinity pool is usually devoid of crowds and you can swim in near solitude with the whole of Shanghai laid out before your eyes through glorious floor-to-ceiling windows. The hotel's bar, definitely one of Shanghai's most iconic venues when it comes to socializing. Its views over the city are simply unique. 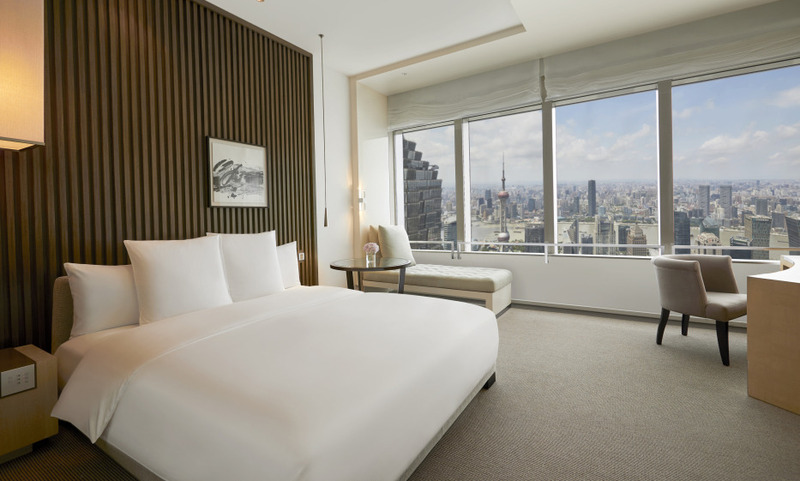 The hotel features the largest standard rooms with highest ceilings in Shanghai (55-60sqm). The hotel offers a large array of gastronomic specialities, displayed in its 9 restaurants and lounges.